BURBANK, Calif. – March 26, 2014 – Walt Disney once said, “We keep moving forward—opening up new doors and doing new things—because we’re curious. And curiosity keeps leading us down new paths.” It’s in that spirit that guests this fall will have the opportunity to visit—or revisit—some of the most beloved Disney attractions of yesteryear. 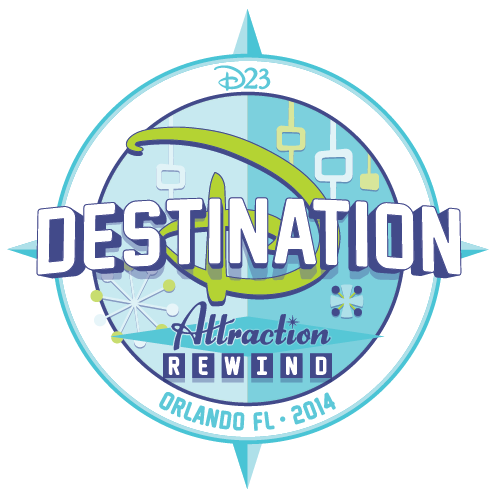 D23 Destination D: Attraction Rewind presented by H2O Plus will take place November 22 and 23 at Walt Disney World Resort. D23: The Official Disney Fan Club will bring Disney archivists, Imagineers, Legends, and luminaries together to celebrate fan favorites such as Adventure Thru Inner Space, If You Had Wings, and 20,000 Leagues Under the Sea with rarely seen concept art and images; vintage video clips; and hours of revealing stories. In addition, there will be a full day of presentations dedicated to the 1964–65 New York World’s Fair, which debuted beloved attractions like it’s a small world and Carousel of Progress. Presenters and panelists include Disney Legends Marty Sklar, Bob Gurr, and Alice Davis; Walt Disney Archives Director Becky Cline; Disney and World’s Fair historians Bill Cotter, Stacia Martin, and Michael Kelley—and more to be announced. During the weekend, guests will be able to explore a special exhibit designed by the Walt Disney Archives in honor of the event. The weekend will end with an exciting evening event—Pleasure Island: Rewind. This celebration of the Downtown Disney nightlife district will include areas dedicated to the Adventurers Club, Comedy Warehouse, Mannequins, and 8 Trax. And of course there will be a “New Year’s Eve” celebration to cap the night. Plus, for the first time, Mickey’s of Glendale, the famed Walt Disney Imagineering store, will set up a pop-up shop at the event for attendees, featuring a selection of exclusive Imagineering merchandise as well as limited-edition pins, T-shirts, and collectibles themed to the event. The shop will also carry a special line from H2O Plus, whose products are featured at Disney Resort Hotels. The weekend event will take place in the convention center at Disney’s Contemporary Resort. Tickets, available Wednesday, April 16, are $190 each and available exclusively to D23 Gold and Silver Members for a limited time. Any remaining tickets will be made available to D23 Free Members on May 28 for $250 per ticket. All guests will receive a special gift in honor of Disney’s contributions to the 50th anniversary of the 1964–65 World’s Fair in New York City. A limited number of “Top of the World” tickets will be available featuring reserved seating, early shopping on November 21, an exclusive dinner reception, special collectibles, gifts from H2O Plus and Ghirardelli Chocolate Company, and more. More details about the program and tickets for D23 DESTINATION D: ATTRACTION REWIND presented by H2O Plus, as well as a special offer just for members of D23, can be found at D23.com/Events. Additional schedule announcements will be made in the coming months. 0 comments to "DISNEY LEGENDS AND LUMINARIES CELEBRATE THEME PARK FAVORITES OF YESTERYEAR AT D23 DESTINATION D: ATTRACTION REWIND"